Microsoft's Surface – the company's first tablet computer produced in-house, and a crucial part of the software giant's strategy to survive the decline of the PC – has been given a thumbs down by reviewers. Reviewers are not urging readers to rush out and buy the £399 tablet, which is competing for attention not only with Apple's iPad and Google's Nexus 7, but Amazon's Kindle Fire in high definition. Wired reviewer Mathew Honan describes Surface as a tablet of both compromises and confusion, a puzzling machine which is designed both for consuming content like the iPad and for creating it like a traditional PC. 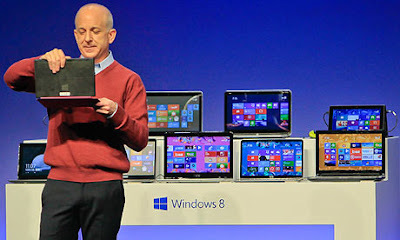 The tablet will be available worldwide on Friday after Thursday's global launch of Windows 8, the most radical redesign of Microsoft's best-selling operating system since Windows 95 a full 17 years ago. Surface, which will only be available to buy online in the UK, runs on a version of Windows 8 called WindowsRT, and its interface is primarily designed for touch. However, it also comes with a keyboard – starting at £99.99 for the touch version – and the basic Office software like Word, Excel and PowerPoint. "Microsoft should have cleanly pulled the band-aid off and ditched the desktop metaphor altogether," Honan says. Surface is delightfully gesture friendly, but it does not compete with the iPad or the Kindle for reading, says Honan, because its long 10.6in screen and 1.5lb weight means it gets uncomfortable quickly. The two high definition cameras are described as junk, with some reviews claiming their pictures are grainy. But Honan's greatest criticism is reserved for the apps, or lack of them. "You'll find a better selection of apps at your local TGI Friday's," he concludes. Microsoft's late arrival in the tablet space means few programmers have created content for the Windows 8 interface. There are just under 4,000 apps worldwide, compared to 275,000 for the iPad. Facebook, Instagram, Spotify and Angry Birds are all missing from the US store, according to the New York Times. The paper's reviewer, David Pogue, says: "Surface is a brilliantly conceived machine whose hardware will take your breath away – but whose software will take away your patience." He describes the device as a compromise: "[Like] a stunning mansion on a bluff overlooking the sea – in Somalia". The screen resolution does not compare with the new iPad's, (1,366 by 768 pixels compared to 2,048 by 1,536 pixels for the Apple product), making small type harder to use. There was also disappointment at the lack of a 3G or 4G connection – Surface connects to the internet via Wi-Fi only. Pogue complains about what he calls the tablet's insanely confusing split personality, moving back and forth between the fast, fluid and fun to use touch interface of the start screen to the old Windows desktop whenever the user fires up the Office programs. At technology site The Verge, Joshua Topolsky that complained the kick stand, which pops out from the back of the machine to prop it upright like a picture frame, was sharp and scratched wooden surfaces. He was unimpressed with the Microsoft designed email service, describing it as slow to update and unresponsive to touch on a regular basis. Other apps, made by Microsoft and by third parties, could be slow to open, then stall or crash altogether. On balance, reviews of the touch interface were generally glowing, and battery life was not an issue – Microsoft's claim that Surface gives eight hours of intensive use was mostly exceeded. The Verge's conclusion: "There may be a time in the future when all the bugs have been fixed, the third-party app support has arrived, and some very smart engineers in Redmond have ironed out the physical kinks in this type of product which prevent it from being all that it can be. "But that time isn't right now – and unfortunately for Microsoft, the clock is ticking."